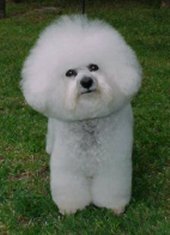 Courtesy of The Bichon Frise Club of NSW, Inc.
A lap dog for the French Royality. Very little shedding and could be OK for allergy sufferers. This small, white lap-dog has travelled relatively unchange from the 12th Century. The Bichon Frise has been a circus trickster, an sailor, and French and Spanish pet. All in all it has maintained a lively, carefree dog willing to please children and adults. May be difficult to housebreak. The AKC standard suggests that Bichon’s should be between 9½-11½ inches tall with black or dark brown, rounded eyes with dark halos. (“Halo” is the skin surrounding the eyes, just behind he actual rim of the eye.) Teeth must form a scissor bite, that is, the top and botom teeth fit/meet together. The coat of the Bichon is one of the breed’s distinguishing characteristics. The coat should have a soft, dense undercoat with an outercoat that is of a coarser and curlier texture. After grooming, the coat “stands” off the body, giving a powderpuff appearance. 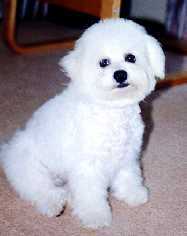 The Bichon does not “yip” like many other of the smaller breed dogs. They have a happy temperament and they need to be around people to be happy — in fact, they are the happiest when they are part of a family and its activities. Good with other pets and children. Because Bichon’s have become lap-dogs, and may not get the exercise they need, OBESITY can become a problem. Read PGAA’s Hypoallergenic Dogs article.